SUNCOS-CG is a range of specialty polymers for cosmetics and toiletries which are chemically modified derivatives of guar gum.These products are especially developed to impart performance functions such as thickening, conditioning, foam stability, softening and lubricity in cosmetics & toiletries like hair & skin care products, cleansing & bathing products. 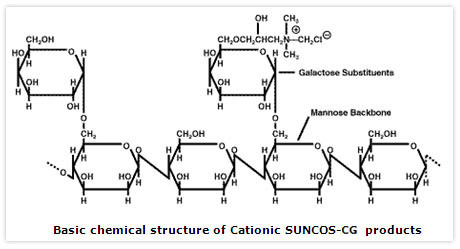 SUNCOS-CG products are cationic in nature and manufactured by reacting guar gum with a quaternary ammonium compound to obtain Guar 2-hydroxy-3-(trimethylammonio) propyl ether chloride or Guar hydroxypropyl trimonium chloride. SUNCOS-CG products have additional conditioning effect due to the quaternary polymer structure having positive charge. Being cationic in nature, SUNCOS-CG products are compatible with other additives being used in cosmetic & toiletry products like shampoo, bath wash, facial cleanser, liquid soap, cream & lotion, hair dye, shower gels and hand wash.
SUNCOS-CG products provide conditioning, combability, flow control and other performance benefits in hair care products. Besides, SUNCOS-CG products also provide moisturizing effect and smoothness when used in shaving cream/gels and hand wash.
SUNCOS-CG products are available in varying viscosities, nitrogen content, particle charge density, microbiological counts and dispersing properties. Customized products can also be provided as per the requirement. Detailed specification sheets are available on request.